There is nothing like the promise of planting a tree. 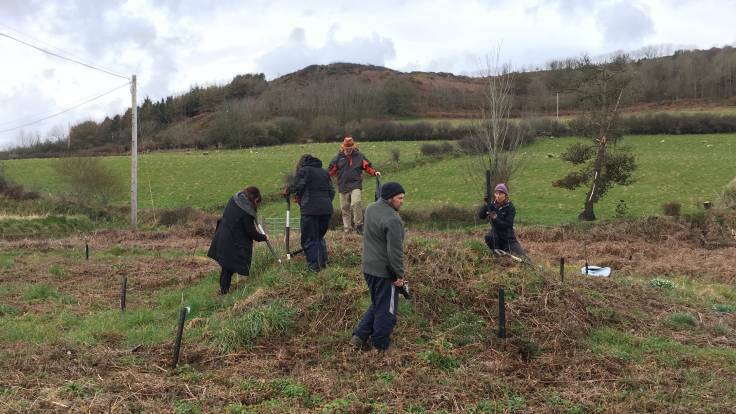 On an overcast Thursday morning in mid-winter late April, Nia and Sophie from The People’s Orchard, with experienced orchardist Martin Hayes, led a small band of resilient volunteers in planting apple and plum trees by the car park at Poppit Sands in Pembrokeshire. Holiday makers decant in the car park and scramble to the sea, casting nary a glance toward the area overgrown with bracken, dog rose and bramble, and it bears an air of mild neglect. A grass path circles the main part, with a mound in the middle, and Martin decided to plant the larger apple trees, all Welsh varieties, on the outside. On the inside, smaller apple trees were planted. The plums, on a rather vigorous rootstock, were given some more space on the other side of the path. 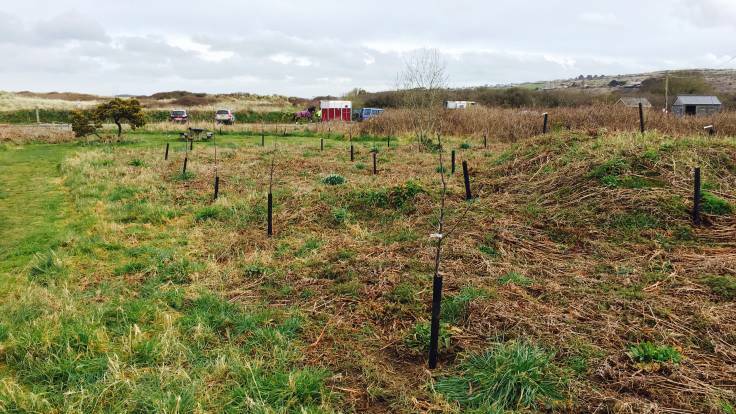 There is a fantastic story behind the small apple trees: on a previous visit, Martin discovered half a dozen or so hybridized apple trees on the site of the old picnic area from the 1960s, trees that had grown from the discarded apple cores of picnicking holiday makers. He had the more promising trees (one of them with a bubblegum aroma!) grafted to provide stock for the rejuventated area. At the end of the planting, it felt as if everyone could feel the promise of the trees. How, in a few short years, children on a jolly to the beach would take a diversion to the orchard and pick apples to eat. Despite the grey skies, everything was lifted. Promises also go both ways. The biggest lesson I’ve learnt on the People’s Orchard’s workshops is that cultivated fruit trees need looking after. It is a commitment, a promise. 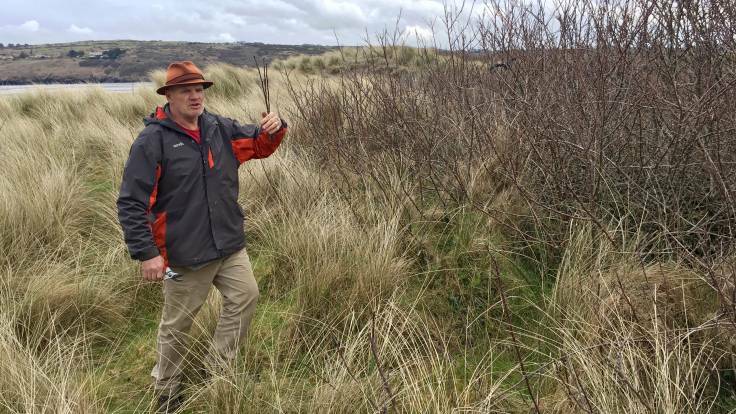 The trees at Poppit Sands will need the bracken cutting back, guards putting up to protect from lawnmowers and pruning every year. And in return, fruit for future generations.